These three companies are "cheap," but is any actually worth owning? Many value investors are constantly searching for stocks that are trading on the cheap. One common way that these investors search for value is to look for stocks with low P/E ratios. Knowing that, I ran a simple screen using Finviz that sorted all of the companies in the S&P 500 by their P/E ratios. I then picked out the three companies with the lowest numbers on the list. The screen identified three stocks -- Transocean (NYSE:RIG), American Airlines Group (NASDAQ:AAL), and General Motors (NYSE:GM) -- that all have trailing P/E ratios well under 5, which suggests that they are absurdly cheap. Let's take a closer look at each to see if any of them is worth buying today. When will the market turn? Transocean is one of the largest offshore-drilling contractors in the world. The company owns and operates a fleet of offshore-drilling rigs that are leased out to major oil producers. With a trailing P/E ratio of 3, you might think that Transocean's stock is now so cheap that it has turned into a value investor's dream. However, the company's net income is projected to turned negative next year, which threatens to turn this formerly highly profitable business into a money-losing pit. Worse yet, demand for the company's services are highly leveraged to the price of oil, so it is nearly impossible to predict when demand will return. That suggests to me that this stock could be a value trap, so I'd recommend that potential investors should proceed with caution. The massive fall in energy prices has been a boon to the airline industry, leading several carriers to book record profits. However, falling costs have caused carriers to compete heavily on price in order to fill seats, which has caused unit revenue to decline. That fact has held back American Airlines Group's stock, currently down more than 13% from its 52-week high. Mix soaring profits with a declining share price, and you get a stock that is currently trading at 3.9 times trailing earnings. Investors have been waiting patiently for the major airlines to follow through on their plans to reduce capacity, which in theory should cause unit revenues to pick up. Thus far we haven't seen that happen, although there are emerging signs that higher revenue could be in the cards for next year. Of course, while revenue growth is important, investors want to see revenue and profit growth at the same time. Right now that doesn't look like it is going to happen. While market watchers expect American's revenue to grow by 3% next year, profits are expected to shrink by nearly 12%. The situation seems even worse when you look out over the next five years, as profits are expected to plunge by 16% annually. On a trailing basis, American Airlines' stock certainly looks cheap, but if we use next year's earnings estimates, then the company's P/E ratio jumps to 8.8. That's still a low enough figure to hint that there could be value here, but with profits expected to contract, this company isn't as crazy-cheap as its trailing P/E ratio would otherwise suggest. 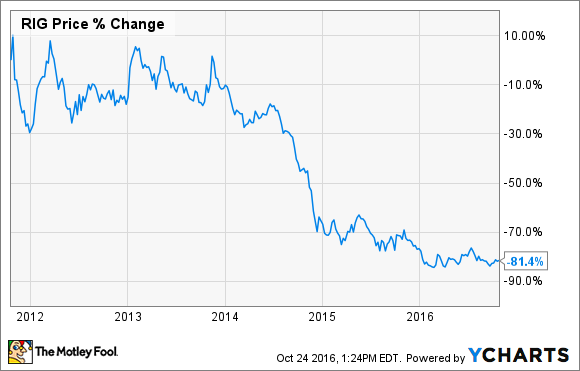 General Motors has been a tough stock to own since it reentered the public markets in 2010. Shares have basically traded sideways over the last few years, badly trailing the returns of the S&P 500. Investors have had a hard getting bullish on the automaker's prospects, and it is not hard to figure out why. Low gas prices have fueled sales of trucks and SUVs, leading some to believe that we are at peak U.S. auto sales. There was also the ignition-switch debacle that caused the company's brand to take a hit. Longer-term, it is still unclear how emerging trends like car-sharing, autonomous driving, and the move to electric cars will affect the legacy automakers. Add it all up, and General Motors' stock hasn't moved much. GM's profits have been heading up, so its sideways stock has pulled its trailing P/E ratio all the way down to 4. However, like American Airlines Group's, analysts are projecting that the company's earnings per share will drop next year, though only modestly. That pushes its forward P/E ratio all the way up to 5, which I don't think you could call "expensive" with a straight face. I'm not terribly bullish on any of these stocks right now, but I do think that General Motors is the most attractive of the group. While profits are expected to modestly decline next year, market-watchers believe that the company will be able to grow profits by more than 10% annually over the next five years. Investors also get to bank a generous dividend yield of 4.6% while they wait for the growth to play out. 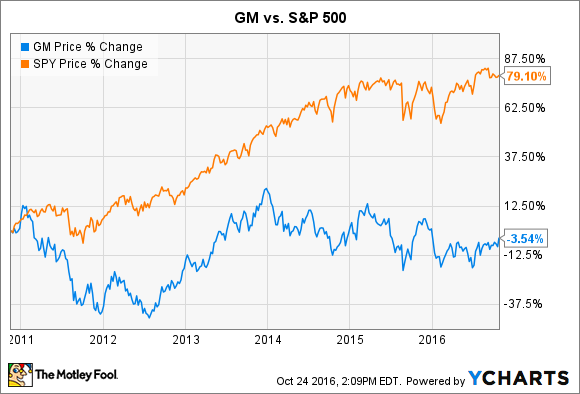 Those figures suggest that General Motors is a stock that value investors might want to look at with a fine-tooth comb.